Software gets updated all the time, and we all get those notifications now and then that an update to Apple's iTunes for our computer is available. If you're like me, you put those updates off. They can take awhile, and, after all, iTunes was working just fine, right? Today, however, I jumped at an update -- even before my computer could notify me one was available. This is the much-talked-about, slightly delayed iTunes 11. With all the updating you've done, can you remember the last time iTunes actually looked different? It does now. That, in itself, is interesting. But the update is more than superficial. For one thing -- and this is hardly surprising -- Apple is trying to shove the iTunes Store in your business a lot more. It's much more prevalent. Those of you concerned about privacy and targeted advertising probably want to be aware of an option when you're installing the new iTunes. It will ask if Apple can have access to your library to provide photos or some such thing. It's probably a way to figure out things to suggest you buy, but I went along with it. I'm all in, baby. Here's a screen grab from my computer. 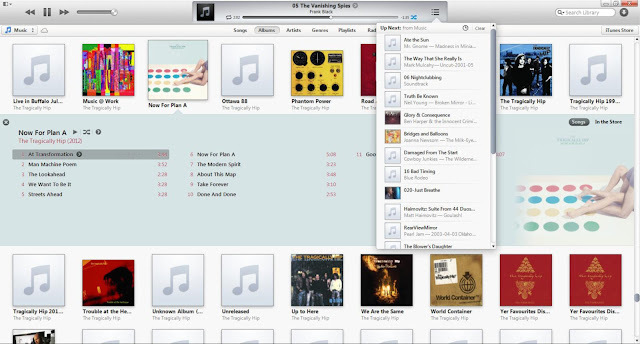 This is iTunes 11 in the album view. As you can see, it's opened the third album from the left in the top row to reveal the tracks, showing the cover art to the right. Above, slightly right of center, you can see the new queue, which you can rearrange and add any time. I highly recommend watching the optional tutorial video after you've installed the program and before you use it. You'll be able to figure out basic operations without it, but, as with previous versions, some of the more detailed controls aren't all that obvious. It's nice to have the visual guide before you dig in. My wife and I saw Steven Spielberg's "Lincoln" on the first day of the film's release. It was breathtaking. I recommend it for anyone who appreciates U.S. history, and a momentous night of movie-going. Not only does the film bring to life one of the most important historical events - the passing of the 13th amendment to abolish slavery - it's appearance as a whole on the big screen is stunning, thanks to the magic and direction of Spielberg. For middle-school teachers and above, I would suggest requesting viewings of "Lincoln" be added to your curriculum. Students would learn just as much, perhaps more, by watching the film as they would cracking open a textbook. "Lincoln" would surely generate wonderful classroom conversations because - let's face it - adding Hollywood to the mix makes talking about history that much more fun and interesting. Danielle Day-Lewis' portrayal of our 16th president is spot-on, and expect Oscar buzz for the actor to begin, if it hasn't already. He's so good, you'll think you were at the White House in 1865. Tommy Lee Jones and Sally Field bring their A games in supporting roles. The only warning: Be prepared for a long engagement. At 150 minutes, you'll need to keep your attention throughout, especially to see how the world of politics was played out in the 1800s. You'll see it wasn't much different than today, that being grown men lobbying for their point of view, and in many cases not taking no for an answer. Simply put, "Lincoln" is riveting from every angle, and can't-miss. The last installment in the "Twilight" series had another strong weekend at the box office — as did "Skyfall" and "Lincoln." Actually, "Rise of the Guardians" fared pretty well (at least, it seems that way, after the mediocre review I read). What movie did you see this holiday weekend? No surprise here: "The Twilight Saga: Breaking Dawn — Part 2" came in first at the weekend box office. 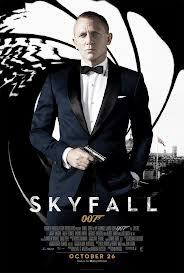 It raked in $100 million more than "Skyfall," which came in second. Pretty impressive numbers. How long will it stay on top? The latest James Bond film easily took first place at the weekend box office. 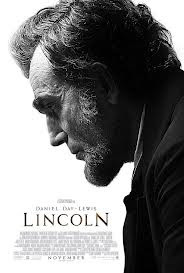 It will be interesting to see how it performs next week when "Lincoln" opens nationwide. If you're like me and starving for a big-screen fix since last summer's "The Dark Knight Rises," I'm confident the short wait is over. The skinny: Craig returns as 007 for the first time in four years, which seems longer since it would be wise to forget the 2008 sequel to Craig's fabulous "Casino Royale," that being the dreadful "Quantam of Solace." I'm confident with that chapter behind the producers of James Bond, "Skyfall" will take moviegoers back to the ways of the original, which gave us a clever story, a cool origin (can you say Q and Bond's Walther PPK gun in this one? ), tons of action, plenty of wit and a bit of humor. Plus, Bond fans couldn't have asked for a better villain than Bardem. The skinny: No, there won't be vampires after Honest Abe in this one, and thank goodness. With Steven Spielberg running the show, it's safe to say this story is in good hands. Adding Day-Lewis to the mix playing the part of the 16th president all but guarantees this adaptation of Abraham Lincoln is a keeper. "Skyfall" will likely be the box-office leader for weeks, but "Lincoln" might have the staying power equivalent to last year's "The King's Speech." Glad to see Spielberg is concentrating on the pivotal moments of Lincoln's life, rather than a complete biopic. Oscar buzz is already beginning. We shall see. The skinny: This film hasn't been garnering much buzz - the first trailer was released just a few weeks ago - but looks interesting nonetheless, even if Hopkins' makeup as the famous horror director Alfred Hitchcock comes up short, at least from shots in the trailer. 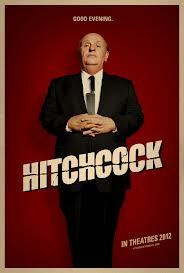 Similar to "Lincoln," this film won't chronicle the director's entire life, but rather on the filming of Hitchcock's most famous film, "Psycho." Johansson plays Janet Leigh, so expect a look back at the iconic shower death scene. During a weekend with relatively good numbers, with "Wreck-It Ralph" easily claimed the No. 1 spot at the box office. 4. "The Man With the Iron Fists," $10.2 million. 9. "Here Comes the Boom," $3.6 million. 10. "Silent Hill: Revelation," $3.3 million. Sunny Beverly Hills can be cold, according to the promo for the third season of "The Real Housewives of Beverly Hills." Set your DVRs: Season 3 premieres at 9 p.m. Monday, Nov. 5. This makes about as much sense as the movies. I have a feeling I know at least one of my co-workers is going to appreciate this.